The west of England, taking in Avon and part of Gloucestershire. The Dobunni were one of the Celtic tribes living in the British Isles prior to the Roman invasion of Britain. There are seven known references to the tribe in Roman histories and inscriptions. The latter part of the name possibly derives from Bune, a cup or vessel. The name seems to have had a similar meaning to the later tribal name Hwicce; both being related to the recognisable cult of a Romano-British goddess. The tribe lived in the part of southwestern Britain that today broadly coincides with the English counties of North Somerset, Bristol, and Gloucestershire; although at times their territory may have extended into parts of what are now Herefordshire, Oxfordshire, Wiltshire, Worcestershire, and Warwickshire. Their capital acquired the Roman name of Corinium Dobunnorum, which is today known as Cirencester. Their Territory was bordered by the Cornovii and Corieltauvi to the North; the Catuvellauni to the East; the Atrebates and Belgae to the South; and the Silures and Ordovices to the West. Some of these suggestions are, however, speculative. There is evidence for a cult associated with the tribe in the Romano-British period; the evidence being coterminous with the tribe's territory. Sculpture has been found at: Gloucester, Cirencester, Nettleton, Bath, Wellow, and Aldsworth. The Dobunni were a large group of farmers and craftsmen, living in small villages concentrated in fertile valleys. A major study of the Iron Age material was carried out by Tom Moore. Remnants of several fortified camps, otherwise known as hillforts, thought to have been occupied by the Dobunni can be seen in the Bristol area at Maes Knoll, Clifton Down, Burwalls and Stokeleigh - all overlooking the Avon Gorge - and at Kingsweston Down and Blaise Castle. In the late Iron Age period, southern Britain saw the development of sites generally referred to as oppida (towns). An example of such a site has been recognised for some time at Bagendon, near Cirencester. It has now been realised that the Bagendon site was not as important as first thought, as other extensive sites are now known to have existed at places such as Salmonsbury. Dio Cassius referred to the tribe as "Bodunni", probably a misspelling of the Dobunni. Tributary to the Catuvellauni, they capitulated to the invading Romans when Caratacus and Togodumnus withdrew. Unlike the Silures, their neighbours in what later became south east Wales, they were not a warlike people and submitted to the Romans even before they reached their lands. Afterwards they readily adopted the Romano-British lifestyle. Even though the Dobunni were incorporated into the Roman Empire in AD 43, their territory was probably not formed into Roman political units until AD 96-98. The tribal territory was divided into a civitas centred on Cirencester, and the Colonia at Gloucester. The Colonia was established during the reign of the emperor Nerva (AD 96-98). At the beginning of the 4th century, Britain was reorganised into, initially, four and then five provinces. The Dobunnic territory lay in the province of Britannia Prima, as described in an inscription found at the base of a Jupiter column. The area remained a Roman Civitas until approximately 409. The Dobunnic territory contained two large towns (Corinium Dobunnorum now Cirencester, and Colonia Nerviana Glevum now Gloucester). Besides this there were numerous smaller towns, and many rich villas. A study of the religion of the Dobunni has shown that there was a focus on the worship of the natural world It is possible to identify deities associated with the landscape; for example: Cuda, a mother goddess associated with the Cotswold Hills, and its rivers and springs, and Sulis Minerva at Bath. Other cults were defined by social action, such as mining, for example at Lydney Park, and hunting, for example at Pagan's Hill near Chew Stoke. After the collapse of the Roman Provincial Government, the core of this area retained territorial identity until the Battle of Deorham in 577, (now largely regarded as a dubious event) when the Saxons made advances as far as the River Severn. These gains where reversed 50 years later when Penda of Mercia fought the West Saxons at the Battle of Cirencester, and the area came under the influence of Mercia as the sub-kingdom of the Hwicce. It has been suggested that the area retained a distinct identity as a Christian sub-kingdom, instead of being simply absorbed into Pagan Mercia, as a reward for an alliance against the West Saxons; and that this is evidence of a cultural continuity between the Dobunni Civitas and the Hwicce Kingdom. Corinium Dobunnorum - (Cirencester, Gloucester) - Established by the Romans at the centre of a network of local roads. 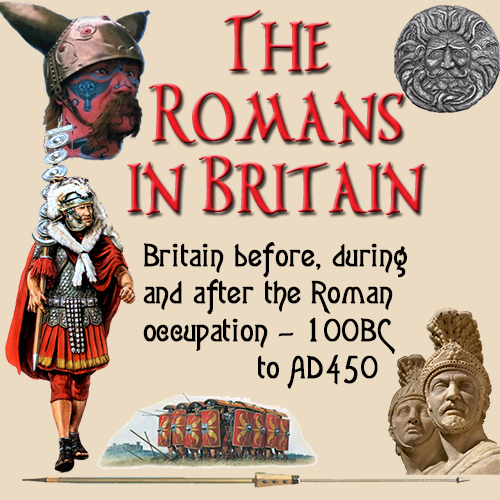 At it's height the town covered more than 230 acres, the fourth largest town in Roman Britain. Alcester - (Warwickshire) - Small walled town. Ariconium - (Weston-under-Penyard, Hereford & Worcester) - A major settlement and administrative centre situated near the Forest of Dean. Asthall (Oxfordshire) - Minor settlement on Akeman Street, between Corinium and Alchester. Atrebatum - (Silchester, Hampshire) near the border with the Atrebates. Bagendon - (Gloucestershire) - Notable oppidum-style pre-Roman settlement near Corinium. Hereford (Hereford & Worcester) - Possible Roman settlement or posting station. Blackwardine - (Hereford & Worcester) - Minor settlement near border with the Cornovii in the north of the canton. Bourton on the Water - (Gloucestershire) - Major settlement on Fosse Way NE of Corinium. Chesterton-on-Fosse - (Warwickshire) - A small walled town near the border with the Coritani in the NE of the canton. Cricklade - (Wiltshire) - Minor settlement on Ermin Way SE of Corinium. Dorn - (Gloucestershire) - Romano-British town on Fosse Way NE of Corinium. Lower Lea (nr. Swalcliffe, Oxfordshire) - minor settlement near borders with the Catuvellauni. Glevum - (Gloucester, Gloucestershire) - The site of at least two large Roman fortresses, a Roman colonia was established here in AD97. Magnis (Kenchester, Hereford & Worcester) - Small town where a milestone of emperor Numerian was found, suggesting that the Civitas Dobunnorum held sway also on the west bank of the Severn. Separated from the civitas capital Corinium by the territorium of the Roman colony at Glevum, it is possible that Kenchester was the centre of an administrative pagus. Nettleton Shrub - (Wiltshire) - Rural temple on the Fosse Way between Corinium and Aquae Sulis (Bath), marking the border between the Dobunni and the Belgae. Salinae - (Droitwich Spa, Hereford & Worcester) - Major town whose important salt industries were worth guarding by the setablishment of an Auxiliary fort. Sutton Walls - (Hereford & Worcester) - Iron Age hill fort continued to be occupied by a small community into Roman times. Stretton Grandison - (Hereford & Worcester) - Minor settlement and auxiliary fort. Tiddington - (Warwickshire) - Minor industrial settlement. Vertis - (Worcester, Hereford & Worcester) - Town and potteries on the east bank of the Severn, at an important strategic crossing. White Walls - (Easton Grey, Wiltshire) - Minor settlement on the Fosse Way SW of Corinium. Wilcote - (Oxfordshire) - Cluster of villas and possible settlement on Akeman Street, near the border with the Catuvellauni. Anted-- Leader of the Dobunnic territories during the first decade of the first century AD. He seemed to have brought together the northern and southern factions of the tribe under a leadership for the first time since the division of the tribe in the latter half of the first century BC. This division was antagonised by their respective successors Catti-- and Comux--. Anted-- appears to have been succeeded by Eisu--, possibly his own son, 30AD. Bodvoc It is probable that he ruled over the northern part of the Dobunni tribe. His brother, Corio appeared to have ruled over the southern part of the tribe,. Whether the division of the Dobunnic kingdom was agree by decree or war, is not known. The is evidence shows that Corio ruled over the entire Dobunnic kingdom for a while before Bodvoc took over in the north. It is possible that Bodvoc was succeeded by Catti-- in the north, while Corio was replaced by Comux-- in the southern territories. Catti-- Possibly inherited the northern Dobunnic lands from Bodvoc around 1BC - 1AD. Comux-- Possibly succeeded Corio as the king of the southern Dobunni around 1BC - 1AD. Corio King of the southern Dobunni in Gloucester towards the end of the first century BC. . It is possible that the splitting of the Dobunnic territories occurred during his reign. Corio was succeeded at around 1BC - 1AD by Comux--. Eisu-- Successor to the united Dobunnic throne following the re-merger of the tribe by Anted--. He assumed power around 30AD, and was probably chieftain during the Roman invasion, though whether he was leader of the faction of the Dobunni that surrendered to Plautius is unknown. Inam-- Appeared to rule over the entire Dobunnic territory. Whether he ruled the kingdom prior to it being divided and shared by Bodvoc and Corio or after the tribe was reunited under the kingship of Anted--, will probaby never be known. Note : Where two dashes (--) follow a name, this name is incomplete and only the portion known is quoted. To see the details of a tribe from an area, pass your mouse pointer over the map and select a specific region. This section is not quite complete, as there are some tribes for which there is little information. These will be updated when the necessary facts have been established.